That's where our dealers come in. 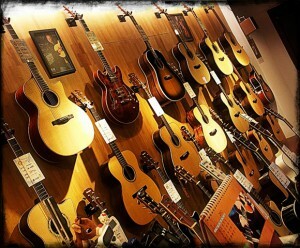 Ready to experience a Goodall guitar for the first time? You can play our instruments at any of the fine stores listed on the map below. Already know which model you want? Your local Goodall Guitar dealer will be happy to help you, wether you are interested in one of their on-hand custom built models, or want to custom order your own one of a kind guitar. Feel free to contact them with any of your questions. Selecting the dealer's title will link you directly to their website in a new window. Selecting the "More Info" link in the search results list, or selecting a dealer's landmark icon on the map, will show relevant details of that dealer within the map. When viewing this map on your mobile device, the list of dealers can be found beneath the map and that list is scrollable.